These rigid frosted plastic access card dispensers allow you to carry your important access cards using a lanyard, badge reel or neck chain. When you need the card you simply need to use the convenient thumb notch to push the card out of its holder. It doesn't get much easier than that. The heavy duty rigid plastic will help to keep your card safe and will prevent wear or damage. These single side load card dispensers are available in either horizontal or vertical configurations. These are Thumb Slide Card Dispensers! 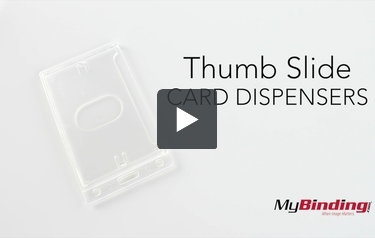 All our thumb slide dispensers are clear, for easy displaying of your card. And they may differ in look, but all have slots in the side so you can use your finger to the card out. Look for ones to attach lanyards or badge reels, the slot fits many types of attachments. Or you can use the side holes to attach a chain. The benefit of these badge holders is the easy removal of your card, but they only come in hard, rigid plastic. Also check out the Access card dispensers for a different approach to easy removal.